Hank Ketcham’s Dennis the Menace was a single-panel black and white cartoon with a caption underneath, featuring a hyperactive five-year-old boy who embarrassed his parents with his anarchic behaviour. It was introduced in sixteen daily newspapers in the USA in March 1951. 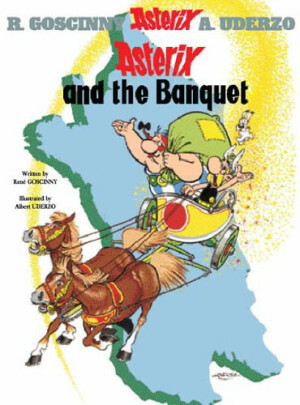 Ketcham’s mixture of tricky situations, his just-cute-enough little boy and intricate, beautiful drawing rapidly became a smash hit. 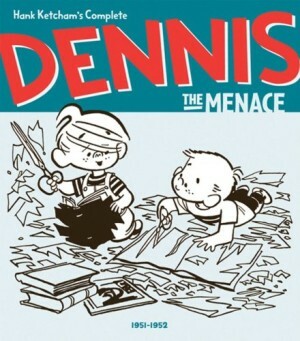 Dennis eventually appeared in thousands of newspapers worldwide, second only to Charles M. Schulz’s Peanuts in popularity. 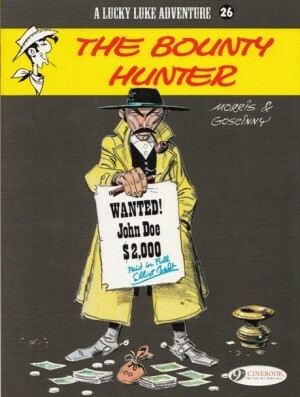 Ketcham took full advantage of all the opportunities for merchandising including a live-action TV show, toys, comic books and chapter books, but unlike Schulz, Ketcham directed a team of artists and writers who ‘ghosted’ for him on both the writing and the drawing of all the spin-off Dennis comics and books. Several hundred Dennis The Menace comic books and ‘Giant’ special editions were published from 1953 to the early 1980s from publishers including Standard and Marvel Comics. They were mostly written by Fred Toole and drawn by two artists, Al Wiseman and Owen Fitzgerald, who were skilled enough to reproduce Ketcham’s style so well that readers had no idea the comics were not by him. They were uncredited in the comics to maintain that illusion, so although careful readers were eventually able to tell that there were different styles of drawing, nobody knew who they were. 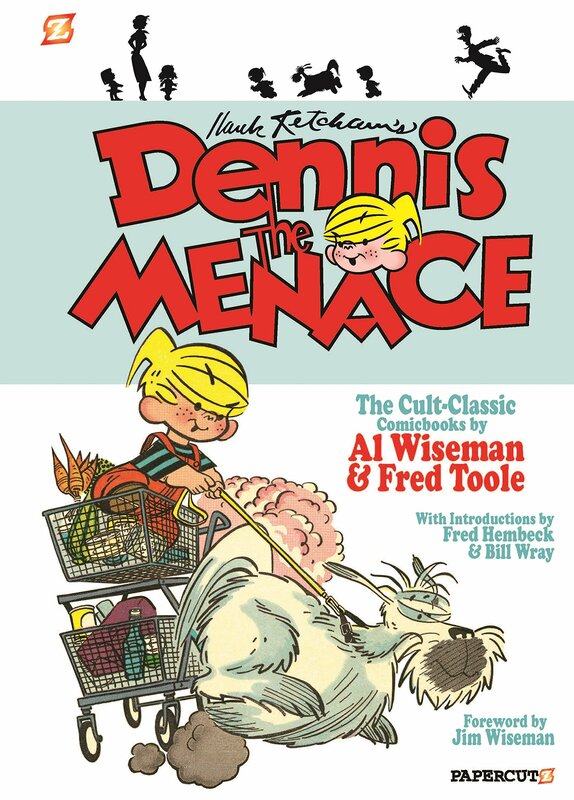 Hank Ketcham’s Dennis The Menace Volume 1: The Cult-Classic Comic books by Al Wiseman & Fred Toole is the first compilation of stories from the earliest issues (1953-1963) and finally gives the writer/artist team who made some of the best-selling comics of the 1950s and 1960s some acknowledgement. It’s long overdue because not only did the two men manage the difficult task of taking a single-panel idea and expanding it into a cohesive world, they kept it fresh through hundreds of stories without repeating themselves. Fred Toole wrote carefully constructed scenes of escalating mayhem in a vast range of environments. Al Wiseman’s meticulously researched and precisely drawn linework was both beautifully crafted and completely believable, delivering a portrait of the modern middle-class 1950s in the USA that still looks attractive today. Not only was Al Wiseman an incredible draughtsman, he was also a superb designer. He used a variety of lettering styles for balloons and captions, sound effects and titles that were more sophisticated than most letterers working in the field at the time. His pages look crisp and dynamic supported by his modern graphics, and the well-timed giant screaming letters for exasperated parents or other adults shouting “DENNIS!” are perfect. 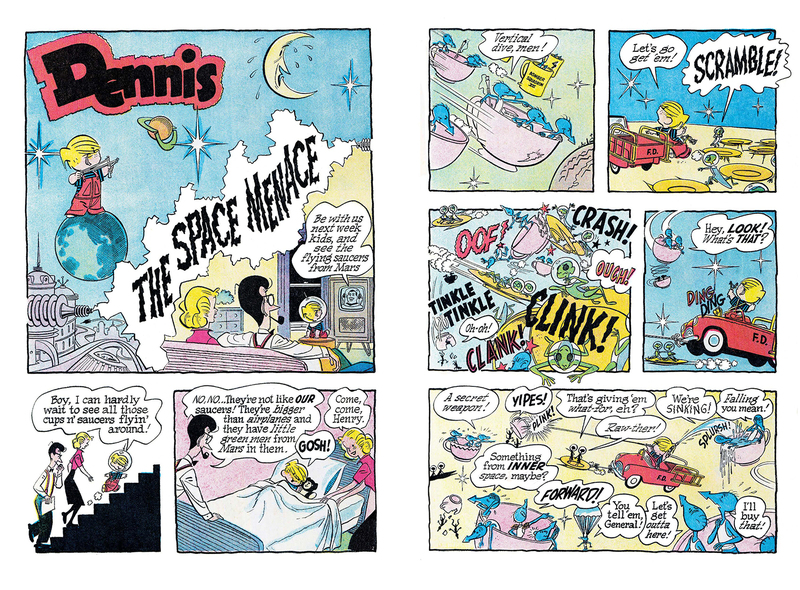 A generation of comics creators grew up influenced by the work of “the good Dennis artist” including Jaime and Gilbert Hernandez of Love and Rockets. You can see a tribute to Al Wiseman in Jaime’s Locas story ‘Home School’ in Penny Century. Artist and writer Fred Hembeck contributes an informative and affectionate introduction to this volume, and artist Bill Wray also writes an excellent appreciation of Wiseman’s work. The foreword is by Jim Wiseman, son of the artist, who describes growing up with his father working on Dennis and shares some personal memories. 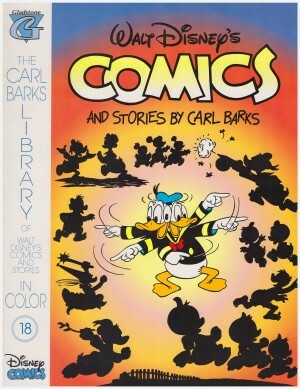 Fred Toole and Al Wiseman should be as well-known and highly regarded as Carl Barks or John Stanley. This volume demonstrates why. Hopefully there will be more to come as there are hundreds more pages of great work from this duo, including the legendarily beautiful ‘Giant’ specials which featured the Mitchell family’s vacations to Hollywood, Washington D.C., Mexico, and most famously, Hawaii. The second volume of this reprint series features the work of the other main Dennis artist, Owen Fitzgerald.